A workflow is any multiple-step procedure that creates a result. A geoprocessing workflow includes geoprocessing tools and geographic data that produce meaningful results in the form of new datasets, maps, charts, and/or reports. For example, you may have a workflow that predicts landslides based on soil, slope, and weather data that use a variety of geoprocessing tools to produce a map of high-risk areas. The list of workflows you can create is endless—crime analysis, site suitability, hydrologic analysis, wildfire management, and so on. Workflows can be written as models or scripts that contain the tools needed to perform your analysis or management process. To create a package or service, right-click a result in the Results window and select Share As > Geoprocessing Package or Share As > Geoprocessing Service, as illustrated below. If you're creating a package, the Geoprocessing Package window opens and guides you through the process of creating your package. From this window, you can add additional files to the package and choose whether to include the data used or just the schema of the data (data schema is the definition of the tables and feature classes but not the actual rows or features). 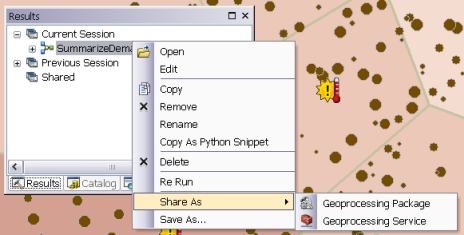 Recipients of your package can drag and drop it directly into ArcMap, and the contents of the package will be unpacked. Data in the package will be written to disk and then added to the ArcMap table of contents. A new result will be added to the Results window beneath the Shared node. Recipients can then examine your tools and data; rerun your tools on the unpacked data; or, by supplying their own input data, add your tools to their own models. In short, they can replicate your entire workflow on their computer. If you're creating a service, the Share as Service wizard opens. After choosing from among a few standard publishing options in the Share as Service wizard, the Service Editor window opens. The Service Editor window is where you define your geoprocessing service. The result is invalid—a result that has an execution error . The Geoprocessing Package window or the Service Editor is already open. The result was created by executing a task within a geoprocessing service—only tools that execute on your computer can be shared. The result is from an execution of the Stage Service or Upload Service Definition tool—these tools cannot be packaged or made into service tasks. The result uses a model tool that has list variables within a model—model tools that use list variables cannot be included in packages or made into service tasks. What is a geoprocessing package? What is a geoprocessing service?